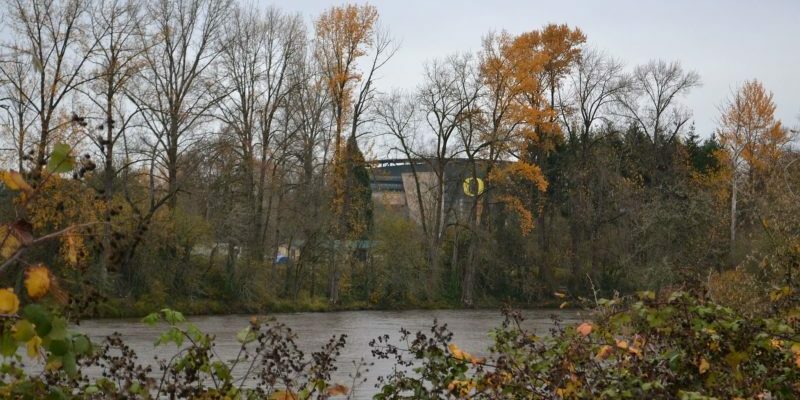 Are We Going to See a New Type of Oregon Football? Summer’s perennial promise has again faded into guilt. I am not so old that summer has lost all its romance, yet every summer I grow more eager for the gift of fall: Oregon football. And as each season starts, we tend to look backwards, however briefly. Many may prefer to forget the Alamo Bowl, but in all things we must analyze the past to see the path forward. There is a reason why Oregon’s preseason ranking is south of the top 20. It’s not simply caprice or prejudice; it’s 2015. 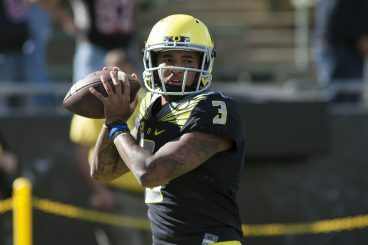 The success of that season suggests Duck fans should prepare for a different kind of post-Vernon Adams football. Adams was a pleasure to watch. But first, I am compelled offer my many thanks to the 2015 athletes for an incredible season, especially the seniors and the early departures who won’t be returning, and your blood, sweat and tears. And thanks to head coach Mark Helfrich for his out-of-the-box recruitment of Adams. Vernon was simply a pleasure to watch. And we are better students of football for having done so. Now to business. Saving the QB question for the moment, the 2016 offense escaped graduation as unscathed as a team can with the loss of three OL regular starters. The good news is not only does the remaining OL core have ample OJT under coach Steve Greatwood, but Pharaoh Brown’s return adds depth to our TE corps. The O-line is ready to move the box for big numbers from the talent. And as for talent at the skill positionsa, with the exception of Byron Marshall, virtually every big play maker is coming back for more. These are the makings of a legendary season. Coach Hoke’s defense will be tested inside. The 2016 defense has flipped: the young secondary is now mature, but the box yields a relatively young core. DeForest Buckner, Christian French, Rodney Hardrick, Joe Walker, Alex Balducci – all gone. 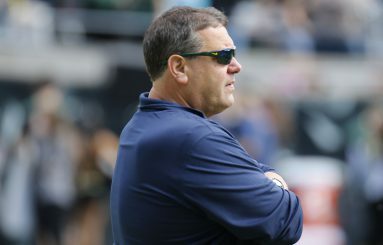 Expect offenses to test the run, play action and quick inside crosses hard and often until new defensive coordinator Brady Hoke proves why he is here. That brings us to the field general who replaces Adams. The expectation is that coach Helfrich has brought in another FCS magician in Dakota Prukop. In typical Oregon fashion, the Helfrich administration is providing no ‘tell’ on the starting job. The Ducks have famously made and transitioned quarterbacks since the Dennis Dixon era – with few hiccups. Darron Thomas easily stepped in for Jeremiah Masoli; and Marcus Mariota notably won the job after Thomas departed early. It is with that tradition in mind that eyes are on redshirt freshman Travis Jonsen, the 6’3″, 195 lb. recruit who was ranked as the nation’s No. 3 dual threat QB recruit. If Jonsen is not in the running for starter, there is an all-too familiar gap under center. If that gap is too wide, Prokup, like Adams, may be irreplaceable. Now our dose of reality: Duck fans have been spoiled. Spoiled during the Chip Kelly era and spoiled under the Mariota era. There were big losses in those years, too – yet in hindsight they seemed to have tested the resolve of the team. For example, the sting of the regular season loss to Arizona in 2014 was replaced by the thumping the Ducks delivered in the Pac-12 Championship Game. So let’s examine the 2015 Ducks production in some detail, because the numbers merit some attention, and describe an about-face from the days of Next Man Up. Truth be told, it’s a tough season to analyze because it’s as if there were two different teams: one with Adams and one without. Focusing on conference play, the 2015 Ducks started strong and, even with a healthy Adams, uniformly played better in the first half. Over the six conference games with a healthy Adams, offensive production averaged 315 yards per first half against 235 in the second. In fact, it peaked in the second quarter: average yards per quarter in this same data set nudged up from 152 to 163 from first to second quarter. I noticed this at the time. This is why I did the math, because of late we’ve grown to expect adjustments at the half that increase production. Most Duck fans can recall calmly watching the 2010 Ducks give up 31 points to Stanford in the first half – 21 in the first quarter – but blanked them the second half en route a 52-31 romp. Second half performances of 2015, even with a healthy Adams, were of a different nature. 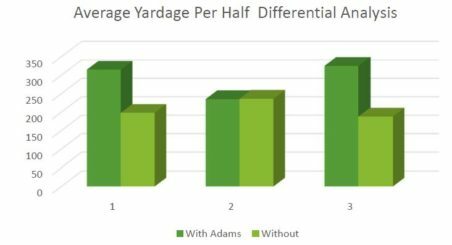 Average yards per second half dropped from 315 to 235; just enough to hold on with a healthy Adams. Notably, second half production was consistent throughout all conference play with or without Adams. The difference? The first quarter: without Adams the production was on average only 59 yards. The second quarter yielded 139 average yards for a total average of 198 yards per first half without Adams. In 2015, without Adams, the Ducks had trouble coming back when down on the scoreboard or holding onto a lead. That was tough to watch. The Alamo Bowl was the manifestation of that lesson. 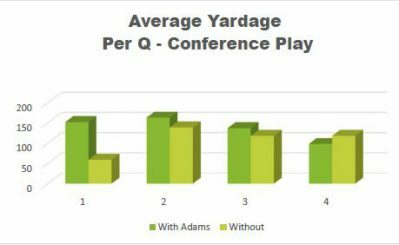 When factored in with conference play, the 2015 Ducks, with a healthy (excluding non-conference play) Adams, averaged 325 yards in the first half versus 188 in the second without Adams: a tale of two teams. The athletic promise of 2015 has been replaced with a deep 2016 roster. A competitive Jonsen would close the gap behind Prukop. The Helfrich plan can work, but 2015 suggests Ducks fans should prepare for a more traditional approach to football: come out fast and strong, build a lead and hold on for the win.